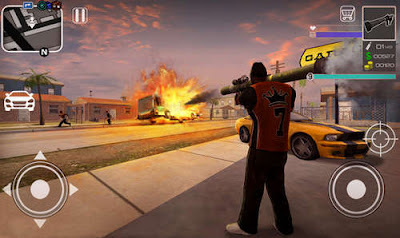 San Andreas Straight 2 Compton (hack) by VascoGames is an epic sandbox action game similar to Rockstar's GTA San Andreas gameplay-wise. You go on missions, steal rides, shoot at people, and do pretty much what you like! The game follows the life of an ex-con as after he's released from prison and is back to his hometown in San Andreas. After the intro players immediately start going on different missions types, killing people, delivering packages, and stealing cars! As you'll be playing using the mod apk of San Andreas Straight 2 Compton, you'll find yourself successfully finishing your missions in record time thanks to the unlimited money hack, rising through the criminal ranks along the way. Compton, California is a corrupt place and our gangstar hero is trying to make his place among the criminal elite. Try not to get killed though, as many former enemies have it out for you! download the apk below, play and enjoy the fast-paced adrenaline-filled action! The game has just been released to Android and version 2.2 is one of the first updates. More info on the Play Store. Game not modded or tested by me, let me know if it works! If you need Zippyshare mirror please comment!